The easiest DIY motivator for me is when I find out how much something costs or how much it is to get professionally done. My husband has had this wingback chair for a few years now that he scored for just $30! The guy that has done some upholstery for us and friends in the past (who is extremely reasonably priced) has moved out of the country. This has motivated me to spend hours reading DIY Reupholstery tutorials and watch countless how-to videos. Luckily, there are plenty of detailed tutorials that I feel like I can conquer this project. The hardest part, and the only part putting me off from beginning is finding the right fabric. I looked at my local fabric stores and haven't found anything that is the perfect fit. So I turned to Fabric.com and Mood Fabrics. I found a few options at fabric.com but only things that worked nothing that I loved. Mood Fabrics was nice to dream about but just too expensive for my budget on this project. Then…while reading last night about reupholstering couches (because why not stop at a chair?) I discovered West Elm sells fabric by the yard. Game. Changer. I ordered a few free swatches to be sent my way to pin up to our wingback chair to see if they are the winners. West Elm's prices were comparable to the fabrics I was looking at at fabrics.com. Another win! 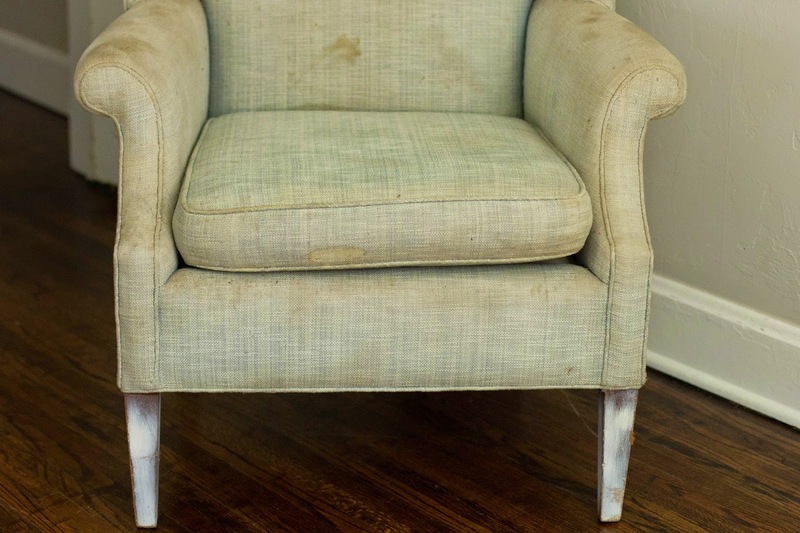 So since this is my first upholstery project…I need your help! Have you ever reupholstered anything? Got any tips? 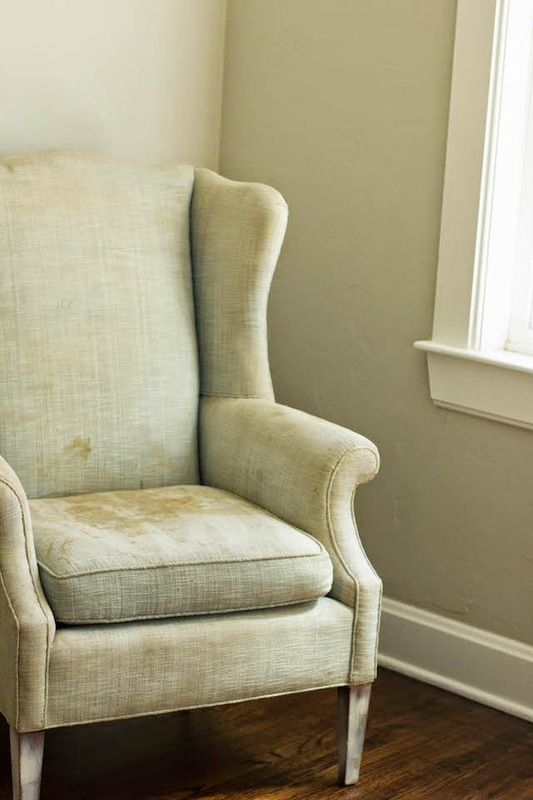 What color would you reupholster this wingback chair? My grandfather was a furniture maker so I've done a few project with his help and on my own. I would say take a lot of photos of the current chair and it's details. Just for reference. If you come to a part you're not sure about you can look back and see how it was originally done. Since every chair isn't shaped the same it can help you when a tutorial can't. I would also suggest playing with different fabrics. Try the piping in a solid fabric if you have a pattern or a contrasting colour for a real pop. Refinishing the wood is always my favourite part and a classic stain really makes it timeless in my opinion. All and all reupholstering is pretty forgiving. I certainly made tons of mistakes helping my grandfather but grab a pair of pliers and pull out your staples and start again! Can't wait to see when you're finished! Thanks so much Shy for the tips! I'll be sure to take pictures, that's a genius tip! Also, It's good to hear it is pretty forgiving, that gives me a boost of confidence for this project! 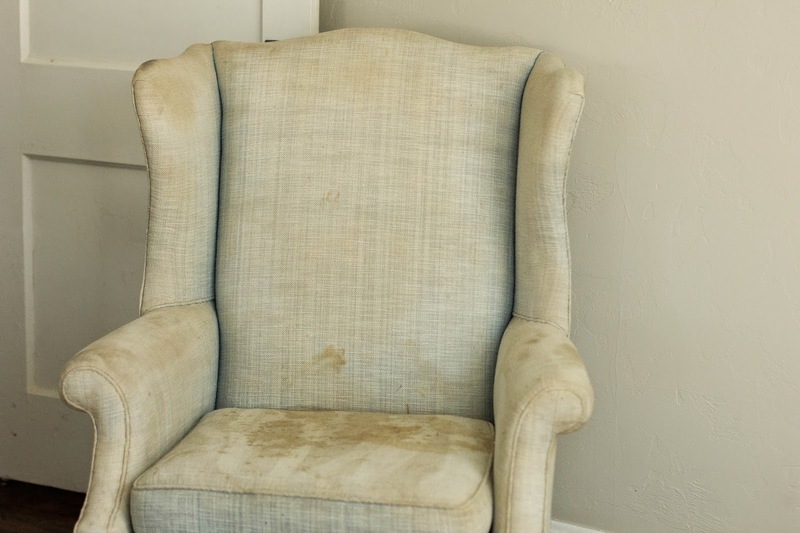 That chair looks old enough that it could be difficult to find a similar fabric. However, when it is done, I am sure the chair will look super stunning. I know that I have always wanted a Wingback chair like this.